Do you have a sofa or chair that needs a new look? We can help you transform your old furniture piece into a new favourite. Our in-store decorators will guide you through the fabric selection and discuss ideas of updating your furniture piece. Your sofa or chair can get a complete overhaul by refinishing the legs and frame, repairing the coil spring system, changing the seat and back foam cores. It can get re-styled by re-shaping the arms, adding a skirt to a leggy piece, or by changing a two-seater sofa into a three-seater sofa. 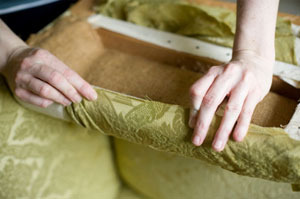 If your furniture piece only needs a change of fabric, we can help you with that too.